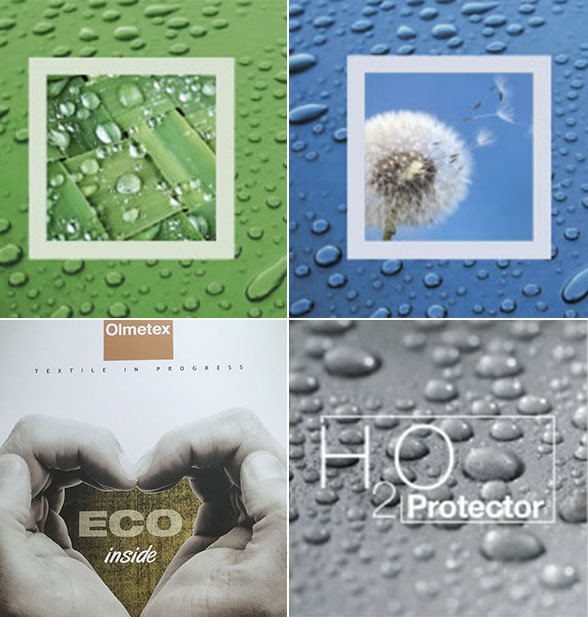 H2O Protector is the result of painstaking research carried out by Olmetex. It is a unique and exclusive fabric whose peculiarity is a natural resistance to water. This is a 100% cotton fabric which is developed from selected long staple yarns which, when given extra twists and woven into a tight compact weave, produces a very high degree of water repellency. On contact with water, the yarns expand and, due to the nature of the weave, the fabric repels water unlike any other. This product is the result of the studies by a group of experts [commissioned by Olmetex] who travelled to some of the most inaccessible places in the world. With their observations of the modes of dress of the Eskimo and the Sherpa, among others, the have been able to achieve a fabric that is not only water repellent, but is breathable, silent, comfortable and above all completely natural in 100% cotton. In a modern world where all is fast moving, transient and high-tech, a real traditional fabric like H2O Protector should be a MUST for all of us. H2O Protector is a clever fabric that responds to humidity. It is tightly woven using long staple fibers which are twisted more than is usual to make a dense fabric. When in contact with water the fabric expands and stiffens, repelling water and other liquids; the fibers return to their original softness once dry. The weaving process also uses 30% more yarn than in a traditional fabric, making it, highly wind proofed as well. For these reasons H2O Protector is a natural fiber in 100% cotton that in terms of breathability-protection has no competition. H2O Protector is a natural yet performing fabric and for this reason it is suitable both for daily use and for extreme situations. One layer of H2O PROTECTOR provides good daily protection. Using a double layer allows you to achieve excellent performance and long-term protection in extreme conditions. The density of cotton adds H2O PROTECTOR excellent resistance against wind or snow. H2O PROTECTOR is a quiet fabric, ideal for active outdoor sports. H2O PROTECTOR initially has high breathable qualities and remains dry inside, therefore additional opening sections are not needed and can adversely affect the water-repellent properties of the finished product. Under normal conditions, H2O PROTECTOR is soft and user-friendly. H2O PROTECTOR has been tested and guarantees excellent wear resistance and long-term protection under different climatic environment. Copyright © 2017 JUMS KIDS. All Rights Reserved.